Jackpine Lodge Condo is one of the most sought after of the nine lodges in River Run in Keystone CO Real Estate. Located at the base of the Keystone Ski Resort, Jackpine Lodge is one of the closest to the Gondola. Jackpine Lodge Condo has only 21 residential condos comprised of 5 – 1 bedrooms, 15 – 2 bedrooms and 1 – 3 bedroom condo ranging in size from 608 – 1430 square feet. While being the smallest lodge in River Run in Keystone, CO it has some of the nicest amenities including a private outdoor hot tub set in tranquility with a cascading waterfall feature, firepit and barbeque grill. Jackpine Lodge Condo also has a lobby with a large flat screen television, ski lockers and an underground garage for parking. 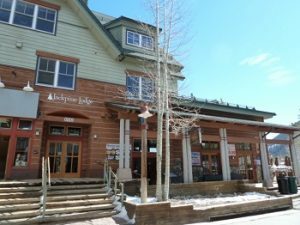 When looking at condos for sale in Keystone Colorado Real Estate don’t forget to see Jackpine Lodge, the closest condos to the Gondola.